When I hung up my uniform for the last time I realized that a huge and fundamental part of my life had changed. What I did not appreciate at the time, however, was how much the people that I had served with during my career were in that change. The military is, in many ways, a closed society. We go to work on bases that are segregated from the civilian population, and we spend days, weeks, and months on end training and preparing to defend the nation from its enemies. We deploy away from our homes on ships and airplanes with people just like us in the berthing spaces and seats next to us. Being in the military is an intense and all encompassing immersive experience. 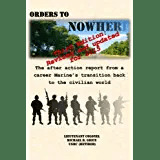 It begins with the shock of meeting your Drill Instructor or Drill Sergeant or whatever your service calls the steely eyed killer who breaks you of all of your nasty civilian habits and transforms you into a Marine, Sailor, Soldier, or Airman. It continues as you go through training to learn your military craft, and the bonds between you and your compatriots is cemented when you show up to your first operational unit. It continues as long as you wear the uniform. Whether you stay in for three years or thirty, you experience a shift in your soul by wearing the cloth of the nation. You become a critical part of a team, and live your life with people who would willingly die or kill for you — and you would willingly do the same for them. It is an incredibly powerful experience that suddenly comes to a shocking end when you get out. One of the questions that I ask in the military transition survey (if you have not taken it yet, please follow this link and help me gather more data: Military Transition Survey) is what you miss the most about serving in the military. What do you think the most common answers are? Cool training? Seeing new and exciting things? The pay and benefits? After spending a lot of time personally reflecting about my service, the people that I have met, the places I have gone, and the things that I have done, the thing that I personally miss the most about my time in uniform is the same. I miss the people that I served with. All of them. Even the ones that I didn’t like very much, because at the end of the day they were still on my team and ready to fight by my side. Relationships are powerful, and they are probably the one thing that you can take with you when you leave the service. So if you are on the way out, make sure to get some email addresses and phone numbers of those you want to keep in touch with. Find a veterans organization that you like and spend some time there. Departing the military will drill a hole into your soul, and it is a hole that only those who have served can really help fill. So don’t wait until it is too late, and reach out to your friends before it is too late and, like your last day in uniform, they are behind you. This entry was posted in Enlisted, Marine Corps, Military Transition, Officer, Retirement, Transition Posts and tagged active duty, EAS, Enlisted, Marine Corps, military, Military Transition, Retirement, transition, Veteran. Bookmark the permalink. And we miss you, Mike. Thanks! It really does mean a lot.